Restoring Files with File History - Ask Leo! 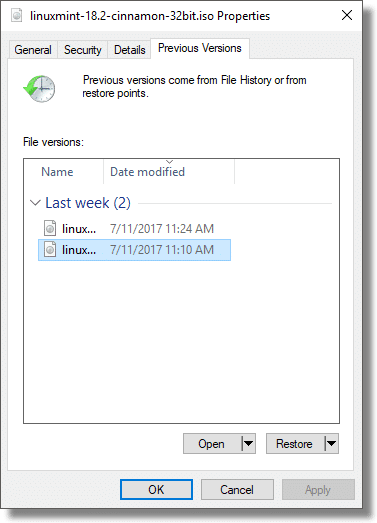 File History, when properly enabled and configured, can restore deleted files or previous version of files that have changed. In a prior article, we turned on File History. Since then, our computer has been carefully looking for files that have changed since the last time it looked, and making backup copies to our external drive of any that have changed. Great. So how do we access those backup copies when we need them? There are two ways. Both are fairly straightforward. Probably the simplest scenario is when you need an older copy of a file that still exists on your hard drive. Perhaps you made changes to it that you want to “undo”; perhaps the file was overwritten by something else; it really doesn’t matter what happened. What you want is a copy of the file “as it was” at a specific time in the past. Fortunately, you had File History turned on, and the file you’re concerned about was in one of the folders that File History backs up. Locate the file in Windows File Explorer, right-click on it, and select “Restore previous versions”. This will open the “Previous Versions” tab of the Properties dialog, listing the current version as well as any previous versions of the file that are available from backup. If only one file is listed, and its date and time match the file as it exists on your hard drive, then you have no additional backup copies from which you can restore. If there are multiple copies listed, select the version of the file you want to restore, and click on the down-arrow next to the Restore button to expose your options. “Restore” replaces the current copy of the file with the backed-up copy, restoring it to the state it was in at the time the backup was created. 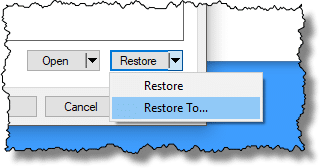 “Restore To…” opens a “Save As…” dialog box. This way, you can save the backed-up copy as an additional file, either in a different location, or with a different name, without affecting the current copy of the file. I recommend using the restore options when retrieving a file from File History. The Open button also shown includes two options: opening the file directly from the backup without restoring it, and opening the file in File History, which we’ll examine next. If the file you want to restore has been deleted, such that there’s nothing to right-click on in the approach outlined above, or if you just want to browse around and see what File History contains, there’s an alternate approach. 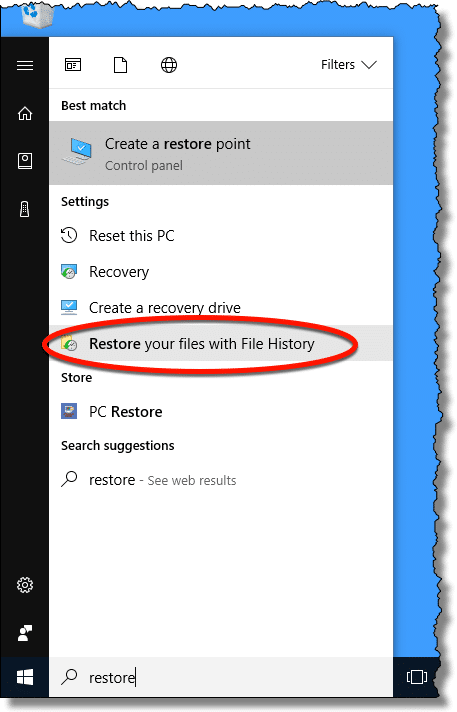 Click on the Start menu and type “Restore”. When it appears, click on Restore your files with File History. This will open the File History browser, where there are several items of interest. At the top, the browser lists the current folder being examined. “Home”, the default location, is the folder located at “C:\Users\<your login name>”. Beneath the current folder is the date and time of the current backup copy being viewed, along with a count of and position within the backups of this folder that are available. In the example above this is the 6th, or most recent “snapshot” of the files, and there are 6 total. Next is a display, much like Windows File Explorer, of the contents of the folder. The left-pointing arrow changes the contents displayed to the next most recent backup, moving backward in time. The green “restore” button restores the currently selected item back to its original location on your hard drive. The right-pointing arrow changes the contents displayed to the next newer backup, moving forward in time. 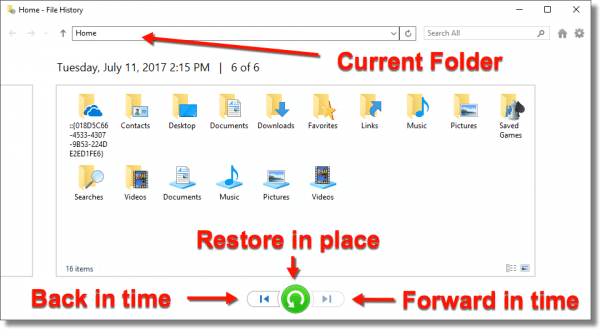 Using the arrow keys, you can browse through the history of the displayed folder, and use the restore button to restore any file you want to. To navigate into a folder shown in File History — say the “Downloads” folder, in the example above — simply double-click on it in the file display. Now you can click the “Back in time” arrow to move into the folder’s history. Previously deleted files may appear. Click on a file you want to restore, click on the green Restore button, and you’ll have recovered the file from File History. You can continue to navigate through your File History by typing folder locations into the current folder box at the top, if you like, or by clicking on the grey up-arrow to its left to move back “up” in the folder tree, and then clicking on other folders and sub-folders as you like. In each folder, you can navigate through the backed-up File History by clicking the forward-or-backward-in-time arrows. It bears repeating that File History is not a substitute for a complete image backup. File History only backs up the contents of specific folders you set; anything outside those folders is not included. When you set up File History, you control which folders are included, but as we’ve seen above, even if you were to have it attempt to back up almost everything (not recommended, due to disk space and time) you’re limited to restoring individual files or folders only. 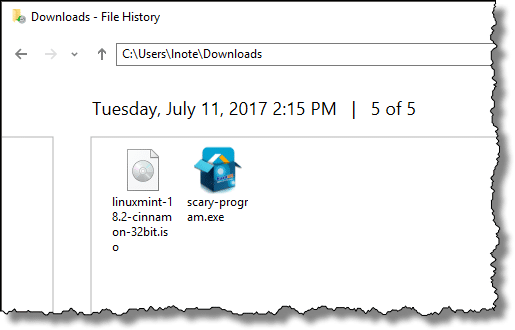 Restoring your operating system or programs that have been installed via a setup program is simply not what File History is intended for. That’s a job for a complete image backup. This article is included in my book, Backing Up In Windows 10, available now. Top-to-bottom, end-to-end, Backing Up In Windows 10 will walk you through all the steps you need to keep your data safe, using Windows 10’s built in tools, as well as a free alternative. 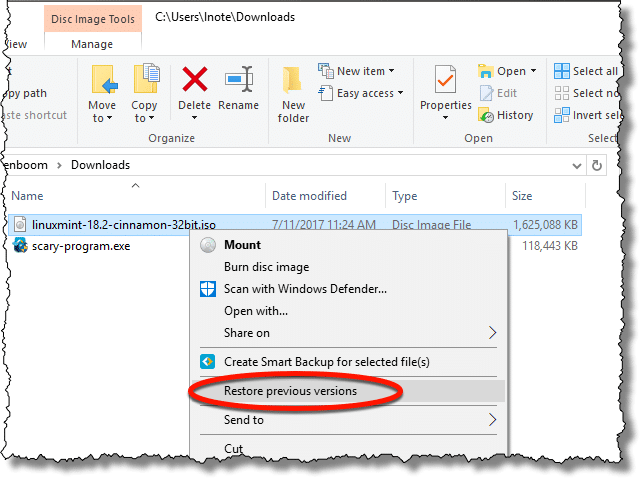 Enable File History in Windows 10 - File History is advertised as Windows 10's backup solution. In reality, it can be a useful component of a larger strategy. I'll show you how to set it up. Restoring a File from an EaseUS Todo Image Backup - Even though an image backup contains everything, that doesn't mean you need to restore it all if you only need one file. « Previous post: My Machine Won’t Boot, How Do I Get at Its Files? As of the time I received and read the email version, Snopes.com seemed to be up and operating okay.